When hearing aids are fitted, they are adjusted individually using a sophisticated computer fitting system. This provides precise fitting of amplification needed to compensate for each person's hearing loss and lifestyle. Our ears are incredibly complex and help us in countless ways. Better understanding them, the problems they can face, and today’s most advanced solutions can better equip you for your journey to hearing better. 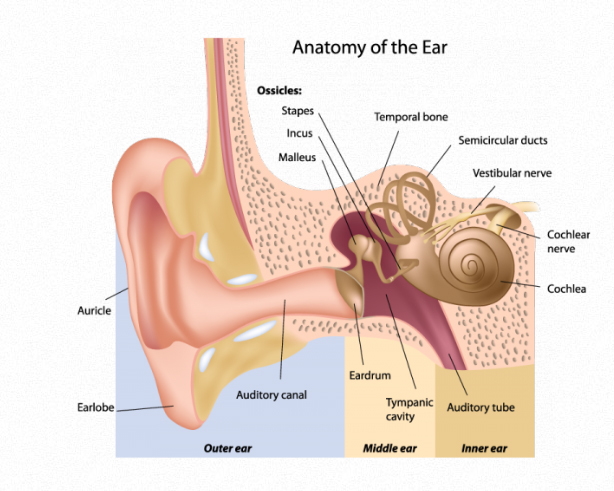 The outer ear — includes the auricle and auditory canal and acts as a sound collector to channel the waves to the ear drum. The ear drum — vibrates and moves three tiny bones, called ossicles, attached to it on the other side in the middle ear space. These ossicles amplify the movement of the ear drum. The innermost of the ossicles, the stapes or stirrup bone, transfers the vibrations to the cochlea. The cochlea — also known as the inner ear, this fluid-filled space contains thousands of tiny cells called hair cells which move from the energy transmitted through the fluid. The motion of the hair cells activates nerve fibers which are attached to them and come together to form the cochlear nerve. In the majority of cases, damage to or loss of the tiny hair cells in the inner ear is the most frequent cause of hearing difficulties. The neural ear — Once the nerves are bundled and enter the brainstem, each individual nerve fiber sends impulses to the brain which encode the original acoustic signal in a way that the brain can make sense of based on the sounds we have heard since birth. Hearing loss can occur at any age, even before birth. Currently, over 36 million Americans could benefit from hearing better, but only roughly 10% actually seek a solution. Hearing difficulties can result from many different causes, some natural, some genetic and some environmental. Noise-induced hearing loss can be prevented by proactively protecting one’s hearing when around very loud sounds. Conductive loss — results from interference with delivering sound energy to the inner ear. It can be treated medically or surgically. Sensory loss — the most common type of hearing loss, it results from irreversible damage to the inner ear—mainly the hair cells in the inner ear that are responsible for converting sound waves into information for the brain. Hearing devices, or a cochlear implant in certain cases, are often the best solution for those who experience this degree of loss. Today’s hearing device technology is incredibly advanced and customizable for each unique wearer. Able to make mumbled speech clear, use directional microphones to help you focus on the sounds that are important, connect to your wireless devices, and automatically adjust to changing volumes, these new hearing devices provide the most natural listening experience possible.